The Update Vendor Statistics updates the Vendor File statistics the same way as the Purge Closed Purchase Orders function without deleting purchase orders. * Enter the range of order numbers to be considered for deletion and other pertinent information. Enter the purchase order number of the first purchase order that is to be included among those con­sidered for deletion. 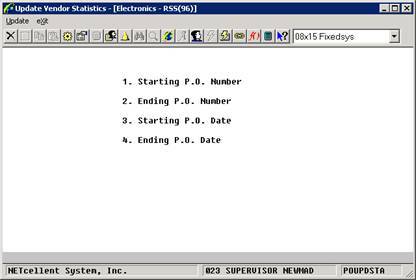 Enter the 6‑digit purchase order number followed by the 2‑digit release number. Enter the purchase order number of the last purchase order that is to be included among those considered for deletion. Enter the earliest purchase order date that will qualify an order to be included among those considered for deletion. Enter the latest purchase order date that will qualify an order to be included among those considered for deletion.